Malas are sacred necklaces, worn and used for Japa meditation (repetition of a mantra) in the religious traditions of Hinduism and Buddhism. They have 108 beads with an end bead called a sumerini or guru bead. To read more about Japa and the significance of 108 beads, and suggested mantras, click here. These beautifully handcrafted wood and gemstone malas and bracelets have been attuned with the healing energies of our ranges: Healing, Prem, Goddess, Offering and Lunar. We also offer plain sandalwood malas. Wearing a combination of sacred woods and gemstones can have a healing and beneficial effect on you. 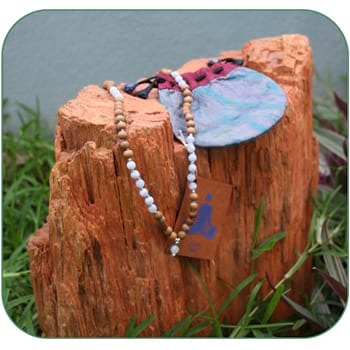 The conscious combination of wearing a mala and using either a mantra or an affirmation for japa meditation can produce an especially positive effect. Strong stringing material is used to make the mala and bracelet durable. All of the malas are 7mm beads, and some of the bracelets use 8mm beads. Due to the natural gemstones and woods used, colours and size may vary slightly. All of the woods and gemstones used are genuine. Malas and bracelets come with a description tag. 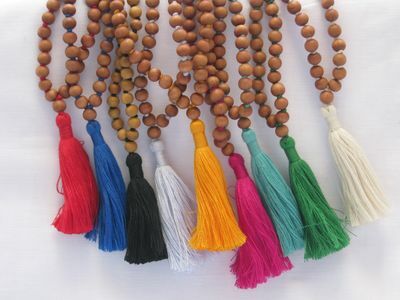 If you would like your own custom made mala, or are interested in malas for children please contact us. Sandalwood malas with coloured thread and tassel. Please specify which colour you would like in paypal comments. Colours available: Red, Blue, Black, Lavender, Yellow, Magenta, Turquoise, Emerald, Bone. Sandalwood and Moss Agate. Sandalwood is a calming wood, its aroma is reputed to aid meditation. Moss Agate is a stabilizing gemstone, and brings vitality to the physical body. Grounding. Sandalwood and Blue Lace Agate. Sandalwood is a calming wood, its aroma is reputed to aid meditation. Blue Lace Agate is a gemstone that helps calm the mind, and is good for fear and anxiety. Corresponding Chakra: Throat and Third Eye. Tulsi (Holy Basil) and Rose Quartz. Tulsi is a feminine wood that represents in Hindu religion Goddess Lakshmi, the goddess of manifestation, abundance and beauty. Rose Quartz is a gemstone of healing and unconditional love. Wearing this mala will attune you to love, healing, and assist with cultivating an attitude of compassion and softness towards yourself and others. Made of Sphathik crystal (clear quartz), Lapis Lazuli and Rudraksh beads. Prem is a Sanskrit word meaning Divine Love. Shiva energy is represented by the 5-face Rudraksh beads, and Shakti represented by the Sphathik crystal. Lapis Lazuli is a stone connected with intuition and deep-seeing. The blue threat represents the great Ganges river, running through heaven and earth. The interconnectedness between Shiva and Shakti and, the cosmos and the earth. Lava, Carnelian and Smokey Quartz. This mala is attuned to the Hindu Goddess Kali, the benevolent and loving destroyer of illusion/ego. Lava (Basalt) is a very grounding stone, as it comes from the core of the earth. This stone can provide stability during tumultuous times. Carnelian is a gemstone associated with strength and vitality, stabilization and courage. Smokey quartz can dispel negative thoughts such as worry. Corresponding Chakras: Root (Base) and Sacral Chakra. Rosewood, Red Jasper and Sunstone. This mala is attuned to the Hindu Goddess Durga, goddess of courage, empowerment and transformation. Rosewood is the wood associated with Maha Durga. Red Jasper boosts energy, strength and vitality. Sunstone is an optimistic gemstone associated with abundance, good fortune and leadership. Corresponding Chakras: Root (Base), Sacral and Solar Plexus. Tulsi, Nephrite Jade and Ruby Jade. The mala is attuned to the Hindu Goddess, Lakshmi, goddess of flow, manifestation and abundance. Tulsi (Holy Basil) is Maha Lakshmi in plant form. Nephrite Jade is associated with good health and abundance. Ruby Jade has been selected for the colour, its rich Ruby colour is associated with Lakshmi, and is a stone associated with vitality. Mala comes with a small lotus charm. Sandalwood, Yellow Jade and Matt Clear Quartz crystal. This mala is attuned to the Hindu Goddess Saraswati, goddess of wisdom, creativity, education and expansion. Sandalwood is a calming wood, known for its meditative qualities. Yellow Jade is uplifting and stimulating, and useful for learning. Matt Clear Quartz acts as an amplifier of of Yellow Jade and Sandalwoods energetic properties. Mala comes with a small Om charm.